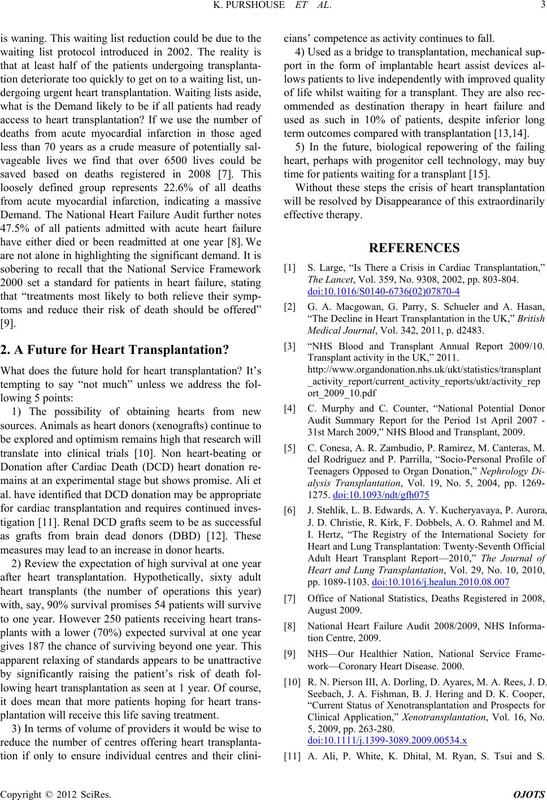 Is There a Crisis in Heart Transplantation? particular reference to the situatio n in the UK. 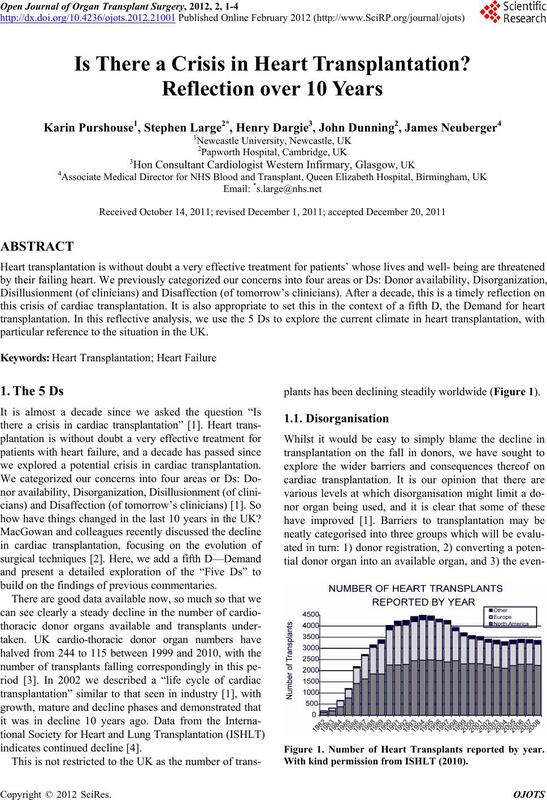 we explored a potential crisis in cardiac transplantation. how have things changed in the last 10 years in the UK? build on the findings of previou s commentaries. plants has been declining steadily worldwide (Figure 1). Figure 1. Number of Heart Transplants reported by year. With kind permission from ISHLT (2010). tual use of the organ. the end of life at a young age . hieve this outcome at times lead ing to reviews of practice. stand alone pediatric centre: a total of seven overall). 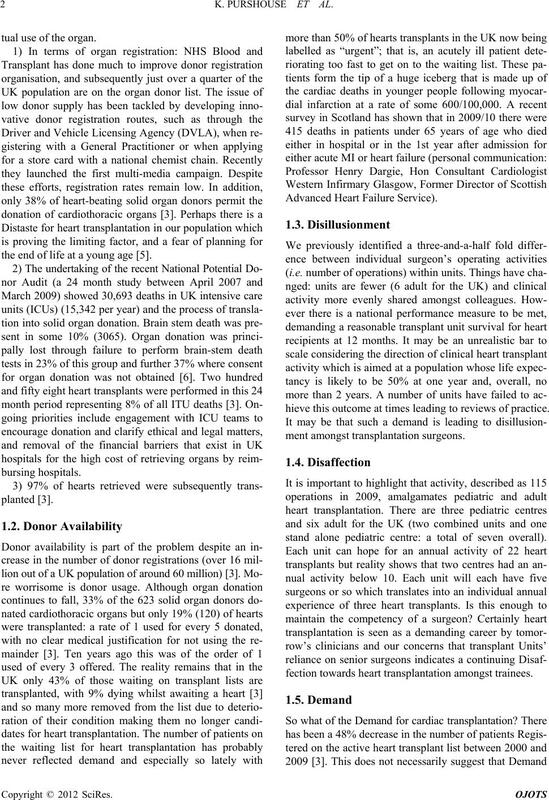 fection towards heart transplantation amongst trainees. 2. A Future for Heart Transplantation? measures may lead to an increase in donor hearts. plantation will receive this life saving treatment. cians’ competence as activity continues to fall. term outcomes compared with transplantation [13,14]. time for patients waiting for a transplan t .
The Lancet, Vol. 359, No. 9308, 2002, pp. 803-804. Medical Journal, Vol. 342, 2011, p. d2483. “NHS Blood and Transplant Annual Report 2009/10. Transplant activity in the UK,” 2011. 31st March 2009,” NHS Blood and Transplant, 2009. C. Conesa, A. R. Zambudio, P. Ramírez, M. Canteras, M.
J. D. Christie, R. Kirk, F. Dobbels, A. O. Rahmel and M.
 R. N. Pierson III, A. Dorling, D. Ayares, M. A. Rees, J. D.
Clinical Application,” Xenotransplantation, Vol. 16, No. 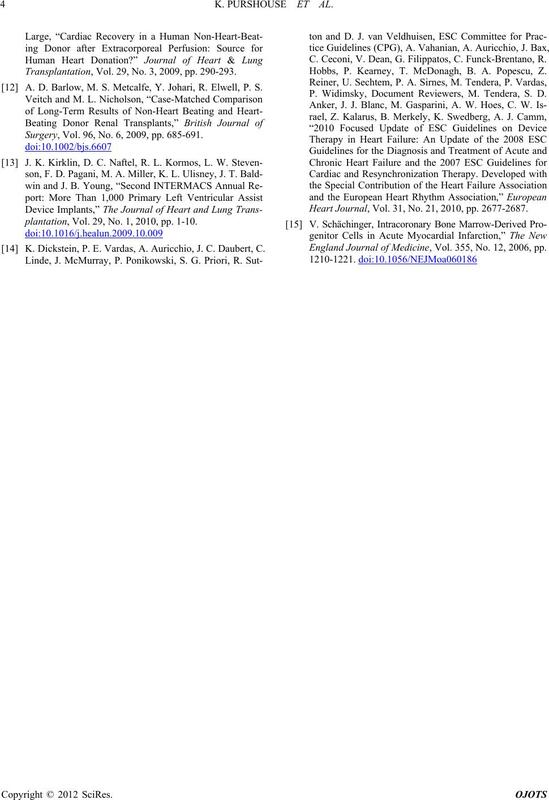 A. Ali, P. White, K. Dhital, M. Ryan, S. Tsui and S.
Transplantation, Vol. 29, No. 3, 2009, pp. 290-293. A. D. Barlow, M. S. Metcalfe, Y. Johari, R. Elwell, P. S.
Surgery, Vol. 96, No. 6, 2009, pp. 685-691.
plantation, Vol. 29, No. 1, 2010, pp. 1-10. K. Dickstein, P. E. Vardas, A. Auricchio, J. C. Daubert, C.
C. Ceconi, V. Dean, G. Filippatos, C. Funck-Brentano, R.
Hobbs, P. Kearney, T. McDonagh, B. A. Popescu, Z.
P. Widimsky, Document Reviewers, M. Tendera, S. D.
Heart Journal, Vol. 31, No. 21, 2010, pp. 2677-2687. England Journal of Medicine, Vol. 355, No. 12, 2006, pp.